Serving all of Los Angeles, Santa Barbara, San Bernardino, Las Vegas and the surrounding areas, Wilshire Refrigeration provides professional appliance repair & maintenance services. We specialize in Cove, Wolf, and Sub-Zero products. Whether you’re looking for reliable routine dishwasher maintenance or prompt dishwasher repair that gets it done right the first time, Wilshire Refrigeration is here to help. Make sure the dishwasher is installed properly according to manufacturer instructions. Make sure the dishwasher is plugged into a grounded outlet or wired direct. Check that the main socket carries an high enough rating to handle the operating needs of your Cove dishwasher. Make sure the dishwasher is level to prevent leaking. Only use dish detergent designed specifically for dishwasher use. Check your water to prevent foul odors. Check for cracks or deterioration in the gaskets. Check the sprayer arm for clogs. Remove any obstructions and clean the arm regularly. Inspect and clean screens and filters according to manufacturer instructions. Set your water heater to 130 degrees Fahrenheit and run hot water prior to running your dishwasher. This reduces the time and energy it takes to heat the water. 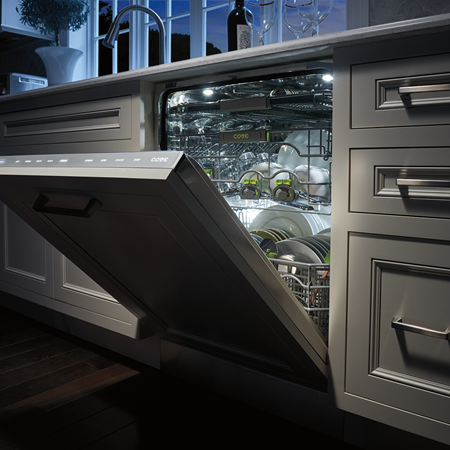 Run full loads to save energy and prolong the life of your dishwasher. Full loads and partial loads use the same amount of water. Avoid using the delay cycle, which fills the dishwasher with cold water and prolongs the time and energy required to reheat the water. Wilshire Refrigeration can help with all your Cove appliance maintenance needs. We specialize in Cove repair and are equipped with the tools and parts required to solve the vast majority of issues with your Cove dishwasher. Noise: Rattling, creaking, grinding, and other unusual noises are often caused by faulty pump housing, motor bushings, or washer arm bearing. Leaking: Leaking is often caused by worn pump or door seals or a failing water inlet valve. Failure to start: An unresponsive dishwasher may stem from faulty door latch switches, timers, fuses, motor relays, or electronic controls. Poor cleaning: If your dishes are still dirty after washing, there may be an issue with the gaskets, spray arms, or water delivery systems. Failure to drain: Timer, drain pump, and drain hose issues can prevent your dishwasher from draining properly. Failure to fill with water: A faulty inlet valve, float switch, or door switch can prevent your dishwasher from filling with water. Failure to dispense detergent: A faulty bi-metal release, wax motor, or timer can prevent your dishwasher from dispensing detergent. Failure to dry dishes: If your dishes are still wet after running the dry cycle, there may be an issue with the heating elements, thermostat, or rinse aid dispenser. Why Choose Wilshire Refrigeration & Appliance, Inc. for Cove Appliance Repair? With over 40 years of experience in the appliance industry, we take pride in providing the fast, high-quality service you deserve. Our highly trained technicians are equipped with a variety of replacement parts and in most cases can provide same-day service for your in-warranty and out-of-warranty appliances. We do our best to complete each maintenance or repair project right the first time, ensuring your peace of mind.